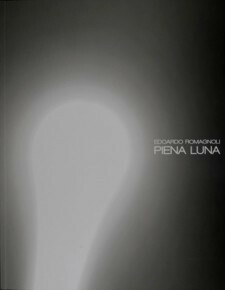 Edoardo Romagnoli has a longstanding and special relationship with the moon which he has featured in many of his photographs and which, in return, seems to have concede to him the most exclusive and spectacular poses. An extraordinary complex body of work has taken shape from this symbiotic mutual exchange, beginning with a black and white research on movement through to the current more articulate visions in which colour takes on a new and central role. The photographer appears to move around urban environments in search of cues and inspiration, or points his lens at the beauty of natural landscape. In actual fact, and this is only becomes apparent after careful scrutiny, Edoardo Romagnoli is skilfully searching for the most fitting setting in which to feature ‘his’ protagonist. Even in the face of such beauty as the Mont Blanc, where he captures the unbroken mountain ranges in such a way as to recall early pictorial portrayals, the photographer never looses sight of his objective: he waits for the onset of light and imprisons it until a white trickle emerges and transforms the entire work into an image dominated by an ancient sense of magic. When he points his lens towards the cloudy night – in the misty countryside of the Lucca region – it is once again the moon that creates those mesmerizing trails that perhaps evoke science fiction apparitions. Capturing movement in a frozen image is what drives Edoardo Romagnoli creating a highly personal style made up of many facets to be discovered: his personal perspective of the highly modern buildings of the Regione Lombardia premises in Milan does not simply denote an original approach to architecture, but also the search for an environment within which to move his moon around, creating quick movements and glimmering trails that bounce off the surface of the building, transforming it into a huge and magnificent sanctuary which, together with the moon, captures and withholds dreams and madness. It is hard to define the poetry of an artist like Edoardo Romagnoli whose expressive journey is complex and has touched a number of levels, moving between the charm of architectural description, researching the mystery of nature and ultimately exploring a highly personal narrative rhythm which, in distancing itself from a reportage-style approach, moves closer to being a sequence with a deeply conceptual flavour. In any case he never fails to give the same kind of detailed care and attention to the quality of his work as is applied to the meticulous creation of a fine art print. Perhaps the best way of defining this artist’s photography is by equating it to an analysis of the subtleties of a visionary evanescence where the central role is played by light, moonlight in particular, a theme that he has been drawn to since the 1990s. Romagnoli creates a special symbiotic relationship with this heavenly body which is made of suggestions and complicity and we, the observers, are encouraged to be part of it. 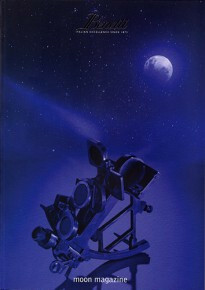 If the moon moves around in the sky, constantly catching the observer off-guard, then the photographer indulges and even accentuates its movements, deliberately moving the camera as he photographs it, in order to turn the shimmering moonlight into a luminous trail, occasionally crossing the space vertically and other times bursting out like an explosion of mysterious, luminous fragments. The game is complex and seductive: the celestial body leaves a trail behind it, aims for the surface of the sea which reflects it, but then turns, changes its direction and tailspins downwards creating an evanescent and mysterious geometry. At times, for a brief moment, the moon appears to come to a standstill and Romagnoli seems to pluck it from the branches of the trees from which it is staring out. He then leaves it, only to stumble across it again at dawn, like a true lady of the sky who, this time, doubles up and multiplies, stretching across the pale blue horizon, in all its beauty and with the freedom to follow a linear journey of total purity. While most photographers try to capture as much light as possible, Edoardo Romagnoli does just the opposite. “I never use flashes, reflecting umbrellas, light metres or any of the light-enhancing paraphernalia usually associated with photography”. Romagnoli’s favourite subject glows with a special light of her own and any artificial enhancement would rob her of her mystery: Romagnoli’s favourite subject is the moon. “There is a special quality to moonlight that makes it especially difficult to capture. After having used film for years I switched to a full frame digital camera recently, but I don’t retouch the images I take. I just manipulate the shutter speed to allow dots or lines of light to enter as I move the camera”. Clearly to photograph his favourite subject Romagnoli has to seek her out under her own terms. “I have to go to places where the moonlight doesn’t have to compete with unnatural light such as glare and reflections from street lamps. These are usually peaceful and remote places that are also conducive to thought and would be inspiring even without the moon”. Just as the moon goes through different phases during the course of a month or so, so too have Romagnoli’s photographs of her varied in the years that she has been his favourite subject. “I have used moonlight as if it were a pencil point and I have used it as if it were a watercolour wash. Some of my photographs are carefully composed drawings and some are wide, free portraits of light. But they always involve the moon and me, the artist who has gone to seek her out with my handheld camera moving to capture her magnificence”. 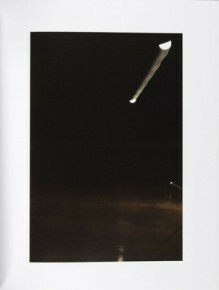 Romagnoli has been photographing the moon since 1988. “I will never tire of observing the her. The fascination inherent in this luminous sphere, so far away and so silent yet capable of bringing light to the night will always bring me new inspiration. My moons are constantly evolving, growing and changing but every time I feel that I have gotten closer to capturing her essence I look again and see that she is still teasing me, maintaining her distance but drawing me close to her”. While he may feel that the moon is hiding a side of herself from him it must be said that Romagnoli’s photographs are as silent, mysterious and metaphysical as the moon. E’ capace di starsene ore in una piazza milanese a danzare con la sua macchina fotografica. Le sue mani compiono strani movimenti per catturare la scia della luna tra i rami degli alberi. Edoardo Romagnoli ha molta confidenza con colei che illumina le nostre notti, molti dei suoi scatti hanno impresso tracce luminose della luna, in affascinanti combinazioni con altri elementi naturali. Il percorso artistico di questo milanese poco più che cinquantenne si evolve in una continua ricerca, sia estetica che interiore. Romagnoli parla di due filoni differenti e li lega a precisi momenti della sua vita e a progetti particolari, ma ho come la sensazione che in lui le due componenti coincidano in tutto per tutto. Perché anche uno scatto esteticamente ineccepibile, in una persona che vive divorata dalla curiosità verso se stessa e il mondo, non può che rimandare a una qualche profondità. Il fotografo ha scelto spesso come soggetto dei suoi lavori la sua città. Con una forza immaginifica non comune, ha saputo trasfigurarla, reiventarla, trovarle l’anima o le varie anime. Oltre che renderla attraente, fatto per nulla scontato per noi che ci viviamo. Romagnoli interagisce con una città che – spiega – è stata generosa con lui, permettendogli di fare due lavori senza giudicarlo, di conciliare vocazione artistica e business. Però il suo giudizio su Milano non è tenero: un luogo per molti versi inospitale, poco accogliente, faticoso da vivere. Ma il fotografo, con la sua poliedricità, sembra dirci che stare bene significa prima di tutto potersi esprimere e lui, dopo aver seguito le orme paterne dedicandosi a un lavoro solido, sta dando ampio spazio alla sua vena creativa. Ogni suo lavoro, che si svolge e si avvolge attorno a un tema denso di significato, a una “matassa” fatta di emozioni, è differente dall’altro, esplora una piccola parte di mondo interiore ed esteriore. Li sovrappone a volte, li compenetra, li rende sorprendentemente interscambiabili. La ricerca di Romagnoli riguarda anche i modi attraverso i quali estrapolare verità dai soggetti fotografati, ad esempio l’idea del “ritratto in corsa”. Il movimento, l’azione del corpo, toglie artificialità ai volti che lasciano intravedere sfumature più autentiche, meno compresse dalla razionalità. La serie dei ritratti “sotto sforzo” è in divenire, molti chiedono di essere fotografati come se questa esperienza rappresentasse un autentico disvelamento, alla scoperta di parti sconosciute di sé. 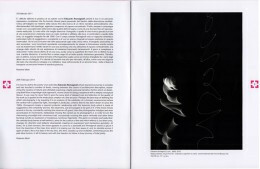 La macchina fotografica diventa per Romagnoli da un lato strumento di verità, dall’altro creatrice di mondi paralleli, che la realtà la sfigurano, la rendono materia pittorica, la reinterpretano con slancio fantastico. Ma in fondo anche in questo non c’è davvero contraddizione e tutto si ricompone nelle opere di questo “provocatore non violento”, come si definisce lui stesso, che vuole smuovere qualcosa dentro di noi, regalandoci intriganti “perturbazioni”, tempeste lunari che hanno il dono di nutrire lo sguardo e le emozioni. «La luce che piove dalla luna non appartiene al versante diurno del nostro esistere. Lo spazio che essa dubbiosamente rischiara sembra essere quello di una terra rivale o di una terra vicaria. Non più quella terra che la luna insegue come satellite, ma essa stessa trasformata in un vassallo della luna. Il suo vasto petto, il cui respiro era il tempo, non palpita più; finalmente la creazione ha ritrovato le sue origini e può ora nuovamente cingersi del velo vedovile che il giorno le aveva strappato». L’attività fantastica delle solitudini notturne possiede una sorta di nebulosa primaria — sostiene ancora Bachelard — dalla quale evoca innumerevoli forme. E nel momento che il sognatore apre gli occhi “ritrova nel cielo questa pasta di biancore notturno (ancora più malleabile delle nubi) con la quale, all’infinito, si possono fare dei mondi”. Nelle foto di Edoardo Romagnoli la sua luna-pixel è un segno primo, è l’immagine primordiale che (riprendendo ancora una espressione bachelardiana) il promotore del sogno “spinge leggermente” oltre la soglia ambigua del reale per assicurarsene “l’umanità”, affinché la fantasia la fertilizzi umanamente; ovvero che essa stessa umanizzi le distese e le energie del cosmo. Giungendo così a una cosmologia dell’umano. Si tratta di una “spinta lieve” ad accelerare, direi catastroficamente, anzi apocalitticamente, l’antica e languida lentezza del moto lunare fino a quando quella sostanza di riflesso astrale non venga trascinata “dal vento della sua propria velocità” verso quell’immortalità del movimento che la nostra percezione contrappone instancabilmente alla caducità delle sostanze. È assai sorprendente che due filosofi, peraltro così remoti tra di loro, come Gaston Bachelard e Walter Benjamin, abbiano colto con tanta trepidazione, anzi per Benjamin con tanta angoscia, il senso assolutamente moderno dello spaesamento cosmico, dello smarrimento spaziale e temporale indotto dalla luce cinerea del nostro satellite. Per ambedue la sperimentazione prima di un’inquietante ambiguità di quel lucore è associata all’infanzia e ai suoi dormi–veglia. «E solo ora il terrore di cui la luna mi aveva fasciato sembrò insediarsi presso di me, eterno e irreversibile. Giacché questo risveglio non pose, come altri, termine al sogno, ma mi svelò che mai termine ci sarebbe stato e che la signoria della luna, che da bambino avevo esperito, aveva fallito il suo appuntamento col corso del tempo.» (W. Benjamin, Infanzia berlinese). E Bachelard tratterà dei sonni e dei sogni dell’infanzia che aprono all’esperienza “dell’essere di un cosmo”: che poi si rivela come repentina solitudine della vertigine (di spazio e tempo), un diagramma del precipitare nella voragine interna dell’essere; un vero e proprio essere–per–la–caduta, “un destino del divenire nel divenire della caduta”. Bisogna anche dire, evidentemente, che pure la luna ci mette del suo: immagine da sempre sottesa tra lo statuto dell’archetipo e quello dello stereotipo, ha suggerito forse alla mente dell’uomo, fin dalle sue prime intuizioni e ha insufflato nelle strutture delle culture le sublimazioni simboliche della periodicità senza fine, della regolarità dei ritmi, del divenire ciclico fino alla speranza o alla condanna dell’eterno ritorno. L’alternarsi di comparsa e scomparsa: del caldo, delle acque, della fecondità di vegetali, animali e donne; la necessaria rigorosa periodicità dei riti e la speranza di un nuovo “quarto di vita” (quello della “gobba a ponente – lunga crescente”) dopo le tenebre della morte. Edoardo Romagnoli con il laser del plenilunio incide il silenzio e l’oscurità della notte, ma sa bene che, così facendo, lui e noi ci ritroveremo con le braccia cariche di oscurità e di silenzio. Voglio dire che i suoi graffiti fotografici dei cieli notturni o crepuscolari ci chiamano a uno stato nascente del segno iscritto nel nostro destino cosmico; una vera e propria cosmogonia delle tracce, possibile solo col ricreare quello stupore del sogno d’infanzia di cui parlavamo. D’altra parte il consegnare al movimento e alle sue forme dinamiche una prospettiva di permanenza oltre la sostanza (“in noi è il movimento più che la sostanza a essere immortale” – sostiene Bachelard) spalanca il sospetto tutto moderno, anzi assolutamente contemporaneo, di una sospensione “apocalittica” del senso del segno e delle strutture simboliche chiamate da Romagnoli a oscillare in una sublime e solitaria ambiguità. Si racconta che, dopo il terremoto del Friuli, lo spaesamento psicologicamente più duro, alla soglia della insostenibilità, fosse rappresentato dalle sia pur piccole modifiche che le scosse avevano provocato sui profili delle creste montagnose: forme e strutture certo fra le più familiari, quotidiane e domestiche; ma nello stesso tempo le figure della permanenza, i simboli di una resistenza caparbia dell’esistente alla furia entropica della precarietà e del caduco. Direi anzi, grazie a questo esempio, che la forza di quanto Freud chiamava “il perturbante” è proporzionale proprio all’abitudine, alla consuetudine, alla assuefazione, alla banalità percettiva della forma che viene in qualche modo modificata, scomposta, disturbata da un evento naturale o dalle molestie blasfeme dell’artista. È il caso dei cosiddetti “ready– made aiutati” creati in grandi quantità dai dadà e dai surrealisti. Vi è un qualcosa di più “perturbante” del metronomo di Man Ray con l’occhio ritmicamente oscillante, l’Indestructible Objet del 1921? La luna è il ready–made di Edoardo Romagnoli, “aiutato”, cioè spinto leggermente oltre il crinale delle percezioni acquisite e consunte verso barlumi di memorie remote o di arcane predizioni. Pur avendo come punto di partenza, assecondando, anzi esaltando con una decisa e intensa sensibilità contemporanea, il nucleo simbolico, archetipico irriducibile di questa diafana e solitaria presenza/assenza notturna. Intendo dire il suo statuto così singolare di ambivalenze irrisolvibili: di sorgente di luce e di riflesso passivo, di vassallo e di rivale della terra, di nemico delle tenebre e di indicatore delle loro profondità; ma soprattutto l’ambivalenza radicale di presenza/ assenza, esserci e mancanza, perdita e ritrovamento. L’alternarsi e l’inseguimento perpetui di epifanie e di aphanisis, che è poi la sospensione di un’attesa indefinita, quell’appuntamento sempre ripreso e sempre mancato col tempo, la cui consapevolezza aveva segnato, per Walter Benjamin, la fine della sua infanzia berlinese. Credo che questo tesoro simbolico (nascosto forse sotto la crosta gelida del Mare della Tranquillità) rappresenti assai decisamente il punto di partenza per le scritture che la macchina fotografica di Romagnoli traccia su quelle lavagne del silenzio che sono i cieli notturni, gli stracci o i banchi di ultimi raggi solari. Baleni, fluorescenze, tracciati, implosioni ed esplosioni, crepitii e fruscii sfolgoranti; tentate geometrie e trionfi frattali; punti, scie, bave, bulbi e bolle. L’immaginazione o, meglio, la fantasia dinamica della luce fertilizza di segni e di messaggi “umani” le profondità misteriose dello spazio– tempo; a volte sembrano penetrarvi splendenti spermatozoi come in Fecondazione o in alcune Nebbie; o anche nello splendido A–Fuoco dove paiono fronteggiarsi l’ingenua speranza del movimento e l’attesa minacciosa di quanto, inerte, lo attende da sempre. Dovunque il movimento e le fosforescenze della sua durata sfidano e affrontano la caducità delle sostanze. Ma, proprio come nel plenilunio, il massimo di intensità del riflesso luminoso (la sua “perfezione” circolare) coincide col momento d’inizio del suo graduale collasso: questo punctum di suprema, arcana, affascinante ambiguità costituisce il fulcro energetico dell’aura che accomuna queste cosmografie di Edoardo Romagnoli. Nella serie dei Tralicci (solo per la cronaca, di qualche anno fa) si direbbe che si consumi, per l’artista, l’ultimo residuo di una realtà ancora legata, ancora dipendente dalle quotidianità del mondo. Ma, come per una improvvisa aggressione aliena, misteriose scariche e folgori paiono rarefare nelle trasparenze fragili di un cristallo gli stessi tralicci e i cavi e gli isolatori. Un mondo di supposte “figure concrete” si dissolve di fronte a una nuova, rischiosa libertà dell’immaginazione e della fantasia: a ricominciare il mondo. E’ lì, luminosa di una luce metallica, e riempie lo spazio dell’intera immagine proprio come una vera protagonista ammiccante e altera: già, perché la luna ha un rapporto speciale con la fotografia che inizia fin da subito, dal quel lontano 1839 quando a Parigi, di fronte all’Académie des Sciences e all’Académie des Beaux-Arts riunite in seduta congiunta la mattina del 9 agosto (giorno di luna nuova che anticipa esattamente di quindici giorni un’ eclissi parziale), è proprio l’astronomo francese François Arago ad annunciare la nuova invenzione che allora si chiamava dagherrotipo. Lui stesso alcuni anni prima aveva provato, assieme a Pierre-Simon Laplace, a riprendere un’immagine proprio della luna anche se i risultati non erano stati positivi. Le coincidenze continuano perché il nome “fotografia” viene coniato da un altro astronomo, l’inglese John Herschel, cui si deve la prima delle immagini della luna seguite a metà Ottocento da quelle di autori sempre più entusiasti come Willian Cranch Bond, direttore dell’osservarorio di Harvard, e Werner de la Rue, astronomo della Royal Society. Essendo scienziati, costoro si erano concentrati sui complessi problemi tecnici, sui rifrattori e sui tempi di esposizione, sugli obiettivi e sulle emulsioni ma forse era loro sfuggito che la luna non è un astro qualsiasi. E’, al contrario, un essere dispettoso che gioca a nascondino, finge compiacimento ma presto inganna, accetta di essere messa al centro della scena come posasse per un ritratto, ma poi sfugge. D’altra parte è sempre stata così: se non si è un astronomo che le cose le sa per bene, si guarda in cielo e lei ora splende là in mezzo poi ci si distrae e la si vede che si nasconde fra i rami di un albero quasi all’altezza dell’orizzonte oppure fa splendere le nubi che la circondano o si fa gialla, rossa, cupa per poi tornare ad essere brillante e argentea. Così è successo che in molti, incuriositi, hanno deciso di andarle molto vicino: nel 1959 un ordigno spaziale l’ha sfiorata fotografandone la faccia nascosta (commentando la notizia sul “Corriere della Sera” il poeta Eugenio Montale mostrò un fastidio che sfiorava l’indignazione), nel 1964 un altro ne ha ripreso il suolo per oltre quattromila volte mentre nel 1969 due astronauti, Neil Amstrong e Edwin Aldrin, riuscirono addirittura a calpestarne la superficie armati di una macchina fotografica. Nonostante avessero una superba fotocamera – un’Hasselblad costruita appositamente che ancora adesso se ne sta sulla luna argentea come lei – i due non erano così abili come fotografi. Lo dimostra la semplicità disarmante del manuale redatto dalla Nasa con cui si erano addestrati ma anche i loro dialoghi durante la passeggiata lunare quando l’uno incitò l’altro a concentrarsi sui ritratti e a “non sprecare pellicola” per fotografare il paesaggio. Strano: quella splendida immagine della terra che “sorgeva” sulla luna (l’esatto opposto dell’incantevole “Moonrise” colto da Ansel Adams nei cieli di Hernandez, New Mexico appena ventotto anni prima) è poi diventata così importante da rappresentare una vera e propria rivoluzione copernicana della visione. I due astronauti avevano sottovalutato la capacità diabolica della luna di diventare protagonista anche quando, invece di essere ripresa, si era trasformata nella base da cui riprendere. Meglio, molto meglio tornare sulla terra, alzare lo sguardo, puntare l’obiettivo e da qui fotografare la buona vecchia luna. Lo fa, fin dal 1990, Edoardo Romagnoli dopo aver stabilito con il corpo celeste un rapporto molto particolare fatto di suggestioni e complicità e di cui noi siamo chiamati ad essere partecipi in quanto osservatori. La luna è sfuggente? Il fotografo accetta la sfida, non ostacola il suo soggetto ed anzi lo insegue consentendogli di disegnare nel buio fitto della notte quei messaggi criptici di cui il cielo è da sempre custode. Ora l’astro si proietta lampeggiante verso l’alto lasciando dietro di sé una scia, ora sembra scendere puntando diritto verso la superficie del mare che la riflette ma poi vira, cambia nuovamente direzione, si avvita fino a creare segni di un’esile geometria che sembra costruita da un bizzarro e irrazionale ragno interstellare capace di catturare la luce. In tutte le culture antiche la luna è un essere – talvolta maschile come Toth, talvolta femminile come Selene – che stabilisce rapporti stretti con gli abitanti della terra che giace là sotto indicando loro la strada della sapienza e della geometria, i segreti del tempo e della magia. Così i nostri primogenitori spiegavano a loro modo, forse per tranquillizzarsi, il mistero dell’attrazione che la luna esercita con le maree e i dispetti che fa a chi non rispetta i tempi della vinificazione e della semina dell’orto. Romagnoli, invece, si fa guidare da un’intuizione e per confermarla va alla ricerca di un luogo isolato dove il silenzio è rotto solo dal sibilo dell’elettricità che corre veloce attraversando i cavi metallici dell’alta tensione. E’ solo ai piedi di quei tralicci che capisce come si possa costruire con l’aiuto della fotografia un mito moderno, quello dell’energia: il suo diventa così un singolare reportage che coglie il momento in cui la luna, là in alto, si impiglia nei bracci dei piloni che forse non a caso si allargano come a voler mostrare le forme tozze degli isolanti lì appesi, simili a frutti da cogliere. Si è avvicinata cautamente, ha allungato curiosa il suo bagliore verso quel sibilo e poi, improvvisamente, ha scaricato tutta la sua forza sulla terra, trasferendovela. Quello era l’istante in cui la luna, questa volta in modo assolutamente silenzioso come si confà a un divinità notturna, iniettava l’energia necessaria a stabilire quel rapporto di reciprocità, quel legame profondo che poi si rivela nei mille aspetti che conosciamo. Ma Edoardo Romagnoli non dimentica l’aspetto seduttivo che costantemente insegue e in cui casualmente si imbatte in una notte milanese quando l’astro improvvisamente gli appare mostrandogli solo l’arco sottile e sorridente della sua fase crescente: siamo vicini ai Navigli e la luce tutta attorno mescola i riflessi della città (i fari delle automobili, i fanali dell’illuminazione stradale, i neon delle insegne) in un melange nebuloso ricco di un particolare fascino poetico. Su ogni cosa, ancora una volta, domina lei, una vera signora del cielo che stavolta si sdoppia in mille riflessi sull’acqua dove, sorprendentemente, è la simmetria a mancare quasi del tutto. Il fotografo la segue nelle molte tracce quando sembra che si abbandoni, quando lascia scivolare dall’alto la sua scia sull’acqua, quando moltiplica i segni che sembrano provenire da più direzioni. Nessuno può dimenticare la storia perché questa si sedimenta dentro di noi e prima o poi riemerge nei modi meno prevedibili: lo si nota nelle tre grandi doppie esposizioni realizzate da Edoardo Romagnoli sovrapponendo alle riprese ravvicinate di terreni pietrosi quelle dove si nota la traccia irregolare della luna in movimento. Torna alla mente quell’orma lasciata dallo stivale del primo astronauta, quelle antiche fotografie che mostravano crateri e avvallamenti ma soprattutto quell’antico e tragico confronto fra Galileo Galilei che quelle screpolature della superficie lunare le aveva viste nel suo cannocchiale e i cardinali grondanti pregiudizio che si rifiutavano di vederle e, pur di non riconoscerne l’esistenza, avevano teorizzato una sfera di cristallo perfettamente liscia al cui interno l’astro era custodito. Povera, vecchia luna così bella proprio come è, con i suoi mari senza acqua, le sue pianure senza erba, le sue vette che nessuno scala e il suo orizzonte da cui continua a spuntare la Terra. Forse ci ha guardato con compatimento, accusata di essere alle origini delle umane mattane dei lunatici o delle cupe patologie dei licantropi, certo non ha mai impedito a nessuno di pensare e ricercare liberamente. Lei, che tutti definiscono fredda, non teme nulla. Nemmeno il confronto con il fuoco cui Romagnoli la accosta in una fotografia di grande suggestione cromatica: tutta la parte inferiore dell’immagine è occupata dal bagliore del fuoco vivo che compare in primo piano mentre sul buio di quella superiore emerge la scia del segno netto lasciata dalla luce bianca della luna. E’ come un richiamo alle origini del nostro mondo quando dal magma da cui tutto stava nascendo anche la luna ha avuto origine. In che modo, ovviamente, nessuno lo sa. Con le fotografie e di Edoardo Romagnoli la luna esce dalla sua orbita e si sbizzarrisce in fantasiose evoluzioni, danzando, volteggiando, rimbalzando ed impazzendo in un magico gioco di sfocature e proiezioni di luce. «E sempre… solo la luna» é il titolo di questa mostra fotografica aperta fino al 12 ottobre, presso la Galleria Il Diaframma-Kodak Cultura in via Brera 16 (orario. T6=19.30 dal martedì al sabato il venerdì solo mattina ore 9-13). 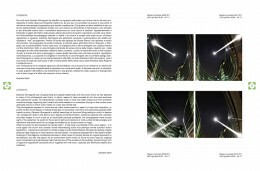 “il tema di questa mostra – come è stato scritto nella presentazione – la luna, si snoda su tre binari paralleli: segno, magia ed emozione sono le motivazioni che hanno guidato l’autore alla scelta dell’oggetto fotografico. Come un voler razionalizzare. attraverso l’anonimato del rullino fotografico inquietudini e mali che la luna comunica all’uomo da milioni di anni. Dalla simbologia indiana, che la chiama Chatki, origine di tutto ciò che esiste, a quella cinese – dove è QuanYin, madre del mondo – per giungere all’esaltazione del nostro più grande poeta romantico, Leopardi, la signora della notte da sempre ha suggestionato l’inconscio collettivo dei popoli nel corso del tempo. Ed è ad essa che si è ispirato Edoardo Romagnoli, un giovane e sensibile fotografo e pittore che attraverso molteplici immagini ce la propone in mostra al museo di Storia naturale- Un lungo lavoro di esposizioni multiple che trasformano il soggetto, lo decantano nell’infinito, nero dello spazio, b librano lungo linee aeree che si perdono elicoidali, scie che sfuggono alla percezione spaziale e attraversano l’immagine reale, creando paraboliche proiezioni protese verso la galassia. Fotografie che raccontano dell’immaginario – la luna è sempre là eterna nel suo moto – ma, per quanto la tecnologia ce l’abbia avvicinata e Armstrong abbia posato – primo – il suo piede, continua a parlare ad ogni uomo un linguaggio diverso. E Romagnoli ci racconta la sua percezione fantasmagorica, i suoi desideri, i suoi fantasmi. È capace di creare delle grandi immagini, dove l’occhio può perdersi in una sinfonia di movimenti planetari; riesce a creare le evoluzioni più ampie per poi ricadere sulla linea di un orizzonte metafisico. la vibrante poetica di questa mostra ben s’accosta con la personalità di Romagnoli, che pur continuando, nella vita, a lavorare come assicuratore e rimanendo con i piedi sulla terra, sa che la libertà artistica va al di là delle leggi del mercato fotografico riuscendo così ad esprimere una ricerca di stile e di tratto raro nel panorama italiano. Tanto da potersi permettere un viaggio… sulla luna. “La luna» di Edoardo Romagnoli è in mostra al museo di Storia naturale, corso Venezia 55, fino al 10 giugno. C’è un che di indicibile nelle opere che – collocandosi alle frontiere estreme (si dice «sperimentali», et pour cause) delle esplorazioni del linguaggio, anche e forse particolarmente visivo – smentiscono i nostri canoni interpretativi nello stesso momento in cui vogliono indagare le possibilità di espansione della visione, avvalendosi talvolta di ricerche sul segno e sulle sue modulazioni. Un che di indicibile, scrivevo, che – quanto poco corrivo si rivela alle nostre abitudini ed alle nostre consolidate richieste di rassicurazione – tanto «sgradevole» o comunque estraniate si mostra rispetto a criteri di lettura che tenderebbero comunque a ridurre tutto a parametri di immediata riconoscibilità. Perché siamo talmente abituati ad assumere la nostra esperienza pregressa come metro di misura che, nel momento in cui nulla in essa si rivela utile a farci comprendere qualcosa di nuovo che abbiamo davanti, siamo presi da un senso di disagio per l’ulteriore sforzo che siamo costretti a compiere. E spesso la via d’uscita più comoda può apparire il rifiuto o la liquidazione. I lavori di Edoardo Romagnoli – che è certo difficile imparentare con esperienze precedenti (anche se richiamano, negli esiti, tutta la grande produzione del mosso «luministico», distaccandosene però per un certo più difficile matrice della sorgente luminosa) si collocano certamente dentro questa serie di considerazioni. Assunta la faccia illuminata della luna come un «segno» di valenza quasi astratta (tanto più in quanto stagliata sul nero assoluto dello spazio notturno), Romagnoli inizia ad intessere il suo gioco di textures, di movimenti di sfocature, attingendo a piene mani alla possibilità dell’immaginario tecnologico che presiede – al di là della «idea» e quindi della volontà – alla formazione dell’immagine sul supporto chimico. Sulla pellicola si condensano, quindi, le suggestioni magiche di millenni di mitologia insieme con la rigorosissima casualità, delle leggi fisico-chimiche: ne nasce un precipitato di emozioni che – anche attraverso il dinamismo luminoso che trasfigura il segno – racchiude forse la sintesi in divenire della condizione e dell’esperienza umana. Vi sono oggetti nell’universo fisico, che come muse impongono l’immagine immutabile di un concetto. Anche la percezione risulta come imprigionata da questa necessità di un richiamo univoco. La luna è la Poesia; eppure, qualcuno, con il dono di una creatività fantastica e ridente, ne ha saputo rendere una nuova raffigurazione, di sorprendente duttilità e ironia, in un’aura di luce che è sempre magia e sorpresa. Edoardo Romagnoli nato nel ’52, milanese, compone fotografie con un’audacia particolare. La mostra dal titolo “ La Luna”, al museo di Storia Naturale da oggi al 10 giugno, è la riproposizione del medesimo evento concepito nello spazio del “Diaframma Kodak”, nel settembre dello scorso anno. Con tre inediti, che non mancheranno dello stupore suggestivo, apprezzato allora da tanti visitatori e appassionati. L’artista ha perfezionato, durante un percorso di oltre tre anni, un approccio libero da preoccupazioni interpretative; l’emozione, il flusso ininterrotto delle sensazione costituiscono la base espressiva della grazia: il creatore stabilisce un contatto pieno, una comunanza gioiosa con il soggetto rappresentato. Da qui, l’impressione continua di slancio, di volo pindarico nelle tenebre; “la luna esce dalla sua orbita” consueta e si trasforma in cometa ineffabile ed effimera. Tuttavia, ciò che sorprende (e non a caso appare indovinata e opportuna la proposta nell’ambito del Museo di Storia Naturale) è il dato fisico, concreto dell’immagine lucente del satellite; Romagnoli ha messo la sua vasta esperienza di grafico al servizio di un’intima convinzione: quella secondo la quale tutto è reale attraverso la molteplicità dello sguardo. «La luna esce dalla sua orbita e si sbizzarrisce in fantasiose evoluzioni, danzando, volteggiando, rimbalzando ed impazzendo in un magico gioco di sfocature e proiezioni di luce. immagini in bianco-nero realizzate a Milano, che vedono la luna proiettarsi e moltiplicarsi su se stessa assumendo molteplici forme e figure astratte che sollecitano e stuzzicano la fantasia dell’osservatore». «Che fai tu, luna in ciel?, dimmi che fai/ silenziosa luna?/ Sorgi la sera, e vai/ contemplando i deserti: indi ti posi./ Ancor non sei tu paga di riandare i sempiterni calli?/». La protagonista di tante poesie, valga per tutte l’incipit del «Canto di un pastore errante…„ di leopardiana memoria, dall’alba dei tempi compagna delle nostre notti, non nuvolose, e anche di molti giorni, il nostro satellite è anche regina di una mostra fotografica che ne sottolinea la natura misteriosa oltre a eleggerla star di proiezioni di diapositive e cortometraggi di Meliès, uno dei papà del cinema. in provincia di Varese. Nell’antico ricovero delle monache, rimesso al meglio dal Fondo per l’Ambiente Italiano, si svolgerà fino a domenica, ma il clou sarà oggi alle ore 21, un inconsueto omaggio al pianeta a noi vicinissimo. Aspettando il plenilunio, nella speranza che non arrivino all’appuntamento anche indesiderati licantropi, com’è noto affezionati clienti delle notti di luna piena, si potranno ammirare prima le diapositive del copro celeste poi numerosi vecchi cortometraggi. Pare solo ieri e al tempo stesso sembra trascorso un secolo dal primo allunaggio di Armstrong, nel luglio 1969. Eppure l’astro d’argento ha avuto la capacità di superare quell’insulto, quella riduzione alla normalità tecnologica; conservando quelle caratteristiche che ne hanno fatto un simbolo nell’immaginario delle anime romantiche. In fondo ancor oggi non ha perso un grammo del fascino che aveva rapito Giacomo Leopardi al punto da meritarsi altri celebri endecasillabi sciolti: «O graziosa luna, io mi rammento/ che, or volge l’anno. sovra questo colle/ io venia pien d’angoscia a rimirarti:/ e tu pendevi allor su quella sel,,a/ siccome or fai, che tutta la ischiari».